Online Donard Park Condominium Auction — Harritt Group, Inc.
Subject to seller confirmation with low below-market reserve. 10% buyer’s premium to be added to the hammer bid price to determine the final purchase price. 10% non-refundable down payment in the form of cash, check or wired funds is due within 24 hours following the auction with the signing of a legal binding purchase agreement. The cash balance of the purchase price will be due in 40 days. Real Estate taxes and assessments prorated to day of closing. Possession immediate at closing. Selling as is with no contingencies, all inspections welcomed prior to auction. First offering to the market as the final settlement of the Arthur Boltz Estate a two bedroom condominium and one car garage located in an established neighborhood in Jefferson County, KY just minutes to the Highlands, East End or Downtown. The Donard Park Condominiums located off Bashford Manor Lane between Bardstown Road and Newburg Road have easy access to shopping, medical, restaurants & schools. 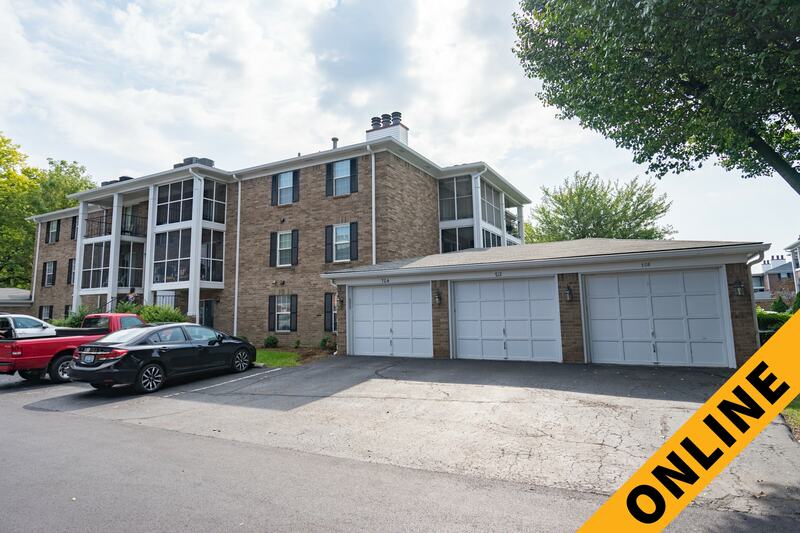 Private residential one level 1072 square foot two-bedroom two-bath third floor condominium unit with two balconies and one-car garage in well-established neighborhood within minutes to Watterson Expressway. The 12-unit brick building built in 1985 is surrounded by common areas, clubhouse and pool. The unit features master bedroom suite with tile handicap shower, walk-in closet & screened balcony, living-dining room with fireplace & screened balcony, eat-in equipped kitchen with french doors, equipped laundry-utility room adjacent to full bath and 2nd bedroom, central air, gas heat plus 12’x20’ one-car garage. Donard Park Condominiums are conveniently located between Bardstown Road and Newburg Road off Bashford Manor Lane in shopping corridor in Buechel area. Surrounded by landscaped entrance and common areas, community clubhouse and pool. I-65 to I-264 East to Bardstown Road Exit# 16. Right 1/2 mile to right on Bashford Manor Lane. 2/10 mile to right on Donard Park Avenue to Building #7 (4th Building on left).